Golfers Book Club – Coming soon. 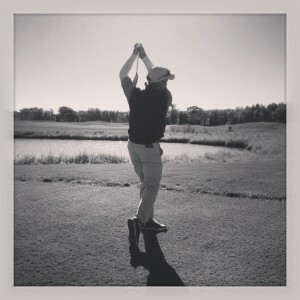 What to Expect at Golf More Swing Less? We’ll dig a bit deep than just golf tips and product reviews. This site goes beyond traditional golf instruction and opinions. I will show you how to reproduce the drills i talk about. I’ll provide visual examples, comparisons and show you how I teach and practice with various training aids. GMSL is the new brand of at home and do-it-yourself golf instruction. Yeah, you heard me. You can do this. You can get better at golf and you do this on your own and even in the comfort of your own home. After a few years of teaching golf, I developed a nice book of business and had many repeat customers. Most of which started to request handouts or videos to curb their learning process. After a year of procrastination I saw an opportunity to help more golfers online so in 2009 I founded Golf More Swing Less. My intentions were to give people my knowledge about club fitting, club making, golf gadgets and the golf swing, in the form of videos and blog posts all for free. Although I was unsuccessful making money online, I did build a small fan base. in 2011 I ended up taking a sabbatical from the site due to lack of time and I sure I could give you a bunch of other excuses. In 2013 I started “King of the Mental Swing” a golf book that focuses on the mental golf swing instead of the mental golf swing instead of the physical golf swing. It’s a quick and easy read full of tips, tricks and affirmations to help you play your best golf. I hope to have available in eBook form by the end of 2014. I’m really excited about this new book. More details to come. In 2014 the Golf More Swing Less Podcast was born. I decided that since I am a much better talker than a writer that I should start a podcast. I am so passionate about golf a so creative at the same time. Some times it feels like my brain is running at 100 MPH. So for me, I can do more and say more in a 45 minute podcast than I can spending 2-hours or more on a blog post. With a podcast, you the listener can hear right from the horses mouth, a real, un-edited interview with one of my many golf industry expert or golf professional friends. With a new website, new eBook and a new podcast, I have many vehicles to share my wealth of knowledge that is all things golf with you. My sole purposes in the GMSL venture is to help others and more specifically at golf. Although this is a golf site, it’s not 100% golf. I hope that what I teach and share with you improves your wellness and life both on and off the course. In the end, a better you equals a better husband/dad, a better friend, a better life and hopefully a better golfer. The GMSL podcast is a free audio show you can listen to or download for free. The shows will range from 30-60 minutes in length. Shows will be packed with quality golf content including interviews, golf tips, golf gadget reviews, golf psychology, health & fitness and even some life hacks. This goes beyond traditional golf instruction and includes, drills, visual examples, comparisons, training aids and more. GMSL is the new brand of at home or on the range, do-it-yourself golf instruction. The goal of each and every episode is to entertain, inspire, educate and improve your game in all facets. GMSL product field testing and reviews are 100% independent, non-bias and all-inclusive. All products are reviewed on a 5-10 point basis covering style, performance, durability, value and overall. I’m Chris Burns. I’m a 30 some year old dude from Wisconsin who loves my family, life, golf and the Green Bay Packers. I know it sounds cliché but I consider myself the luckiest man I know. I’ didn’t make it on the PGA Tour and I’m not a millionaire. That’s alright, I have in life what matters most. That is an amazing wife, one, soon to be three amazing children, a loving family, and a passion for golf. I developed a passion for golf while growing up in and around the golf business my parents owned. Thirty plus years later, I am a Division III collegiate golf coach, veteran golf instructor, savvy club fitter, innovative club maker, golf writer, and podcaster. Although there are days when I think I have it all figured out, I have learned that those who teach must never cease to learn. As an instructor, coach and podcaster, I am always looking to improve my knowledge, patience and communication and yes, there is always more to learn. Through my 15+ years teaching, coaching, fitting and club making, I have helped thousands of people play better golf and I want to help you. I hope you find value in the Golf More Swing Less blog and podcast. If you do, please join in the conversation, shoot us a message, join the community or leave a review on iTunes. Remember – Think positive and be positive, it’s contagious.